Curiously, sets carrying 4-digit number references began to appear in 1970. So far, sets numbered 9081, 9232 and 9261 have been recorded: they are all un-catalogued 1970 sets and appear to have been Special Train Sets made for some of the large retail stores or mail order / home shopping companies. Although the 1970 Catalogue had introduced a new four-digit numbering system for many individual models the sets had continued to be numbered with a three-digit code. 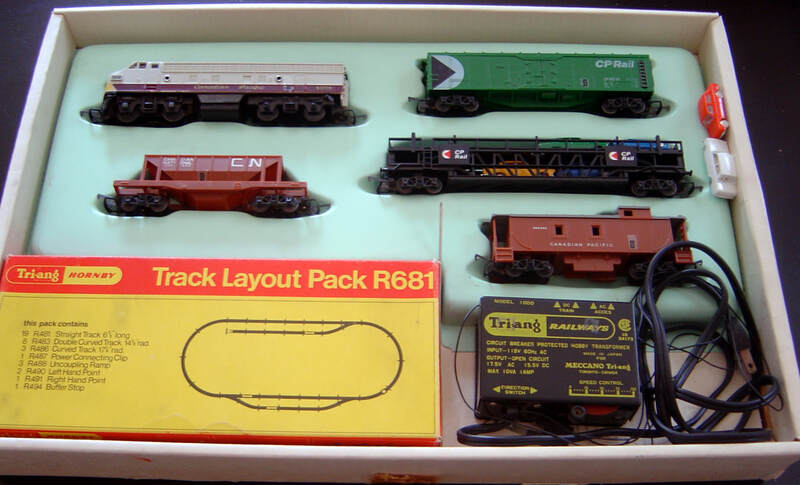 It would have been logical to insert a number for this set into the sequence 920-925 which had been intended to be used for the 1970 Special Sets sold mostly to the large department store chains and mail order / home shopping companies. However, this was not the case and, therefore, it may have been that these numbers had already been provisionally allocated to planned Special Sets for 1970 by the time that this Special Set No. 9081 was ordered by Simpsons and Simpsons-Sears. The use of the set number 9081 (being 'shorthand' for 908-1) indicates that this is a variation / updated version of Special Set No. 908, issued in 1969, which had also been produced for Simpsons and Simpsons-Sears and sold through their retail outlets. The use of the suffix '1' now appears to be the code number allocated to Simpsons-Sears Special Sets for 1970. This has been a difficult set to date with absolute certainty but it now appears that this Special Set No. 9081 was produced and issued in 1970. The box packaging is unusual. The all-white card box base suggests a date of 1969 but the greenish-blue plastic tray insert indicates that the set should date from 1970 onwards. 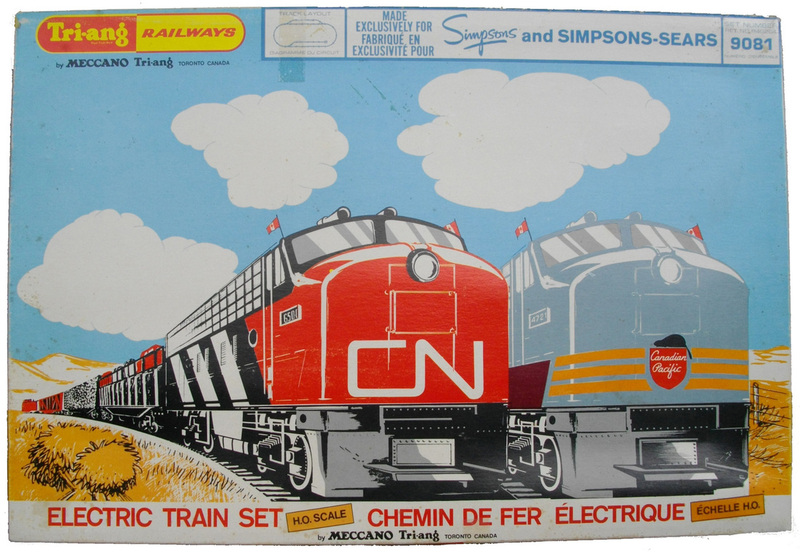 The owner of the first set (illustrated below) states that it was purchased for him as a Christmas present in 1970 from the Simpsons-Sears retail department store in Vancouver. According to Lines Bros. company records, the first manufacture dates of the green CP Rail Paper Car and the CP Rail Car Transporter are both May 1970 which would confirm the date of issue as 1970. The Simpsons and Simpsons-Sears reference - 'RET. NO.' followed by a number - printed on the box lid indicates that this Set No. 9081 would have been intended for sale through their retail outlets; as opposed to being marketed through their home shopping / mail order catalogue(s). ​This set utilises the exact same format inner tray as that used in the 1969 release Simpsons and Simpsons-Sears Special Set No. 908 (and Set No. 909). Just the colour of the plastic differs. 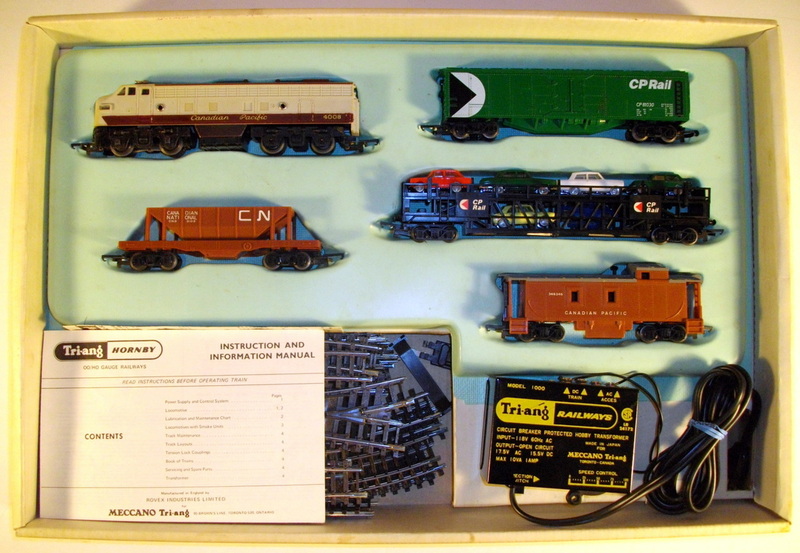 The illustrated set shows the R.0552 Canadian Pacific Diesel Locomotive, R.1353 CP Rail Paper Car, R.1111 CN Hopper Car, R.3423 CP Rail Car Transporter, R.1152 Canadian Pacific Caboose, Model 1000 Transformer and R.681 Track Layout Pack. The Canadian Pacific Diesel Locomotive was to be discontinued from the range in the 1971 Catalogue. It had been superseded by the new livery CP Rail version of the model in February 1970. This set would have provided the manufacturer a good opportunity to get rid of some of the excess remainder stock. The R.1353 CP Rail Paper Car was first made in May 1970 and the R.3423 CP Rail Car Transporter also dated from May 1970 which seems to confirm the 1970 date for this set. 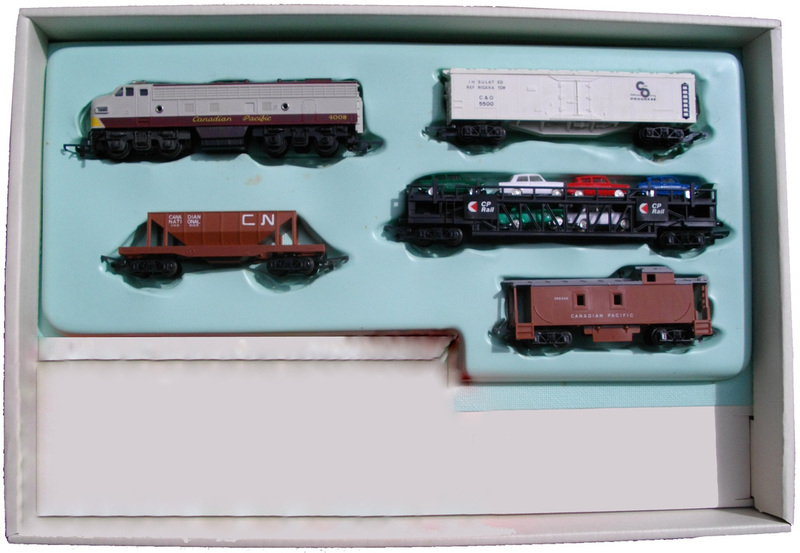 ​The illustrated set contained the R.0552 Canadian Pacific Diesel Locomotive, R.1290 C&O Railways Refrigerator Car, R.1111 CN Hopper Car, R.3423 CP Rail Car Transporter, R.1152 Canadian Pacific Caboose, Model 1000 Transformer and R.681 Track Layout Pack. It would appear that the set contents varied slightly over a period of time. Perhaps this was deliberate or perhaps it depended on the availability of stock in the factory when the sets were assembled. The Canadian Pacific Diesel Locomotive, the Hopper Car, the CP Rail Car Transporter and the Canadian Pacific Caboose are all constants in the illustrated sets. The only variable is the Box Car / Stock Car / Refrigerator Car. As with all these previously undocumented sets the usual proviso applies; it is so simple to swap around any of the set contents in the plastic tray inserts. ​Therefore, it is essential to have definitive proof and/or be able to confirm that the set contents are correct as originally supplied by the manufacturer. ​This next illustrated set contained the R.0552 Canadian Pacific Diesel Locomotive, R.1261 Canadian National Stock Car, R.1111 CN Hopper Car, R.3423 CP Rail Car Transporter, R.1152 Canadian Pacific Caboose, Model 1000 Transformer and R.681 Track Layout Pack. All that can be offered as provenance is that I contacted the original owner of this set and he confirmed that the illustrated set is as purchased new for him, by his father, in 1970. 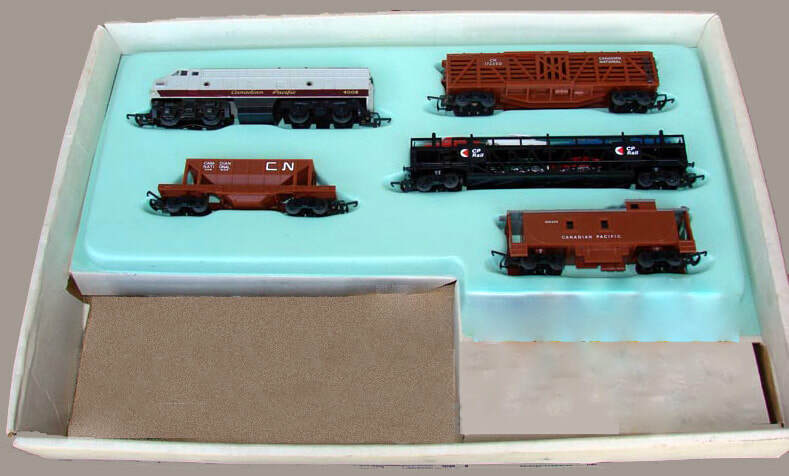 He had never owned a R.1353 CP Rail Paper Car (as included in the first mentioned version of this set) or the R.1290 C&O Railways Refrigerator Car (as included in the set above).